The dust had settled from World War II, and some scientists at the University of Chicago, a few of whom had been instrumental in creating an atomic bomb for the Manhattan Project, were voicing misgivings — discussing, debating and putting their concerns in a pamphlet called the Bulletin of the Atomic Scientists. It was 1947, and the Bulletin was turning into a magazine. Its creators were searching for an artist to illustrate its cover, and Martyl Langsdorf accepted the challenge. Needing to find a way to convey urgency, she came up with a clock. 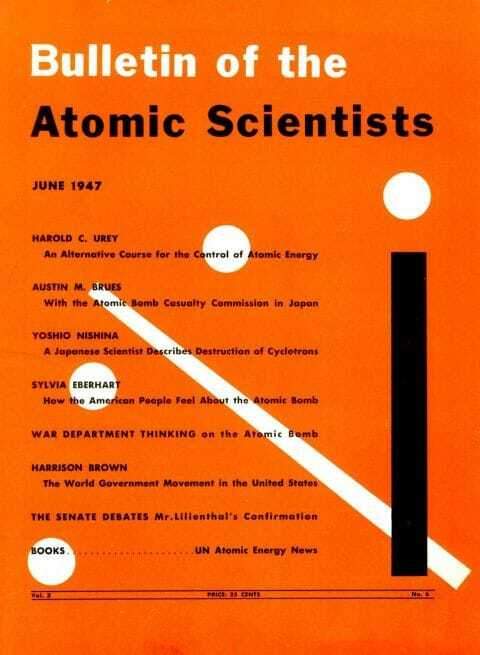 In June 1947, it appeared on the cover of Bulletin of the Atomic Scientists — a simple black-and-white clock over an electric orange background. She made the decision “both because of the urgency that it conveyed and also because of the tick, tick, tick, tick nature of it — that it would move toward midnight unless we could push it the other way,” Rachel Bronson, president and chief executive of the Bulletin of the Atomic Scientists, said Thursday in an interview. Over the past seven decades, the symbolic ticker has tocked between two and 17 minutes until destruction — a metaphorical measure of humankind’s proximity to global catastrophe. Each year, scientists and nuclear experts grapple over the state of geopolitical affairs and use the clock to try to illustrate it. “When we set it, we think about two things: We think about, ‘How should we set the clock compared to last year?’ but we also think about, ‘How does it compare to history?’ ” Bronson told The Washington Post. Langsdorf, the clock’s creator, was married to Alexander Langsdorf Jr., a nuclear physicist who helped develop the atomic bomb for the Manhattan Project during World War II. “The publication known as the BULLETIN OF THE ATOMIC SCIENTISTS came into being as a pamphlet in December 1945,” Martyl Langsdorf said in a history about the clock on the Bulletin’s website. She said as the publication was transforming, co-founder Hyman Goldsmith asked her for help. Kennette Benedict, a senior adviser to the Bulletin of the Atomic Scientists, said in a 2013 column that the artist initially thought about designing a cover using a “U” to represent uranium. But, “as she listened more intently to their conversations,” Benedict added, “she soon realized that it was the atomic scientists’ urgency about the looming dangers of this new technology that was most compelling. “So she drew the hands of a clock ticking down to midnight. Like the countdown to an atomic bomb explosion, it suggested the destruction that awaited if no one took action to stop it,” Benedict said. In her written history about the clock, Langsdorf called that idea her most “significant” design. 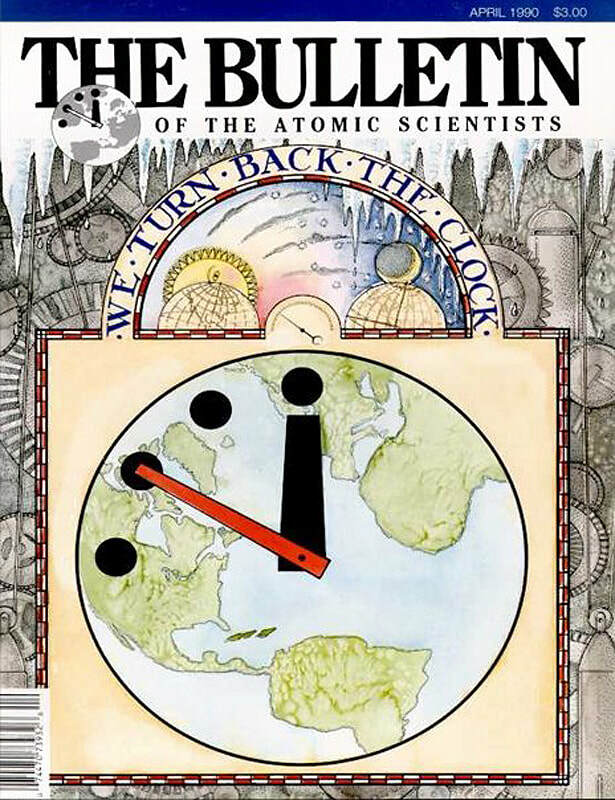 “The June 1947 issue was the subsequent result and the clock became the logo of the BULLETIN. We moved the clock’s hands forwards and backwards as the times indicated,” she added. Two years later, in 1949, the Soviet Union tested its first nuclear weapon, and the Cold War began in earnest. The scientists who guided the bulletin — including Mrs. Langsdorf’s husband, nuclear physicist Alexander Langsdorf Jr. — reconfigured the image of the Doomsday Clock by moving its hands four minutes closer to midnight. In one stroke, Mrs. Langsdorf’s design had been reinvented as a wide-reaching symbol of the age. A powerful idea was expressed in a visual image containing four dots and two lines. What was once a static image had become a dynamic illustration. Schudel added: Mrs. Langsdorf’s simple visual image entered pop iconography as an element in songs by the Who, Iron Maiden and Bright Eyes. It was featured in novels and nonfiction books and became a near-universal symbol of the dangers lurking in the modern world. Bronson, the Bulletin’s president, said the publication credits Langsdorf for the Doomsday Clock. “I think the power of the clock is that it was created by an artist,” she said. “It was an artist who deeply understood the scientists — these were her friends and her husband — she was very engaged in the issues they were studying.